It started off a bit rocky, with an impatient Canadian border guard at Jean Lesage international airport in Quebec City questioning why I, an American doctor, would be working and taking care of patients in Canada; but things are decidedly looking up now that I have made it over that speed bump and down the road to Roberval, Quebec. My biggest problem now is getting WiFi access. Thank God for Tim Horton’s!! My hotel can’t get me WiFi, other places in town that proclaim free WiFi don’t deliver. I grabbed a coffee at Tim’s (avoiding the donuts; on the road, sitting in planes and cars, I don’t need those tasty calories) and, voila! Internet access. So, lest anyone think I’ve been remiss in communicating over the blog, on Twitter @cjsmonline, or on the Facebook page (https://www.facebook.com/cjsportmed), I have simply been unable to do so. And one more thought about Tim Horton’s before I turn to the swimming. Many readers will know this, but some will not: the donut chain was founded by a revered former NHL player, Mr. Tim Horton himself. 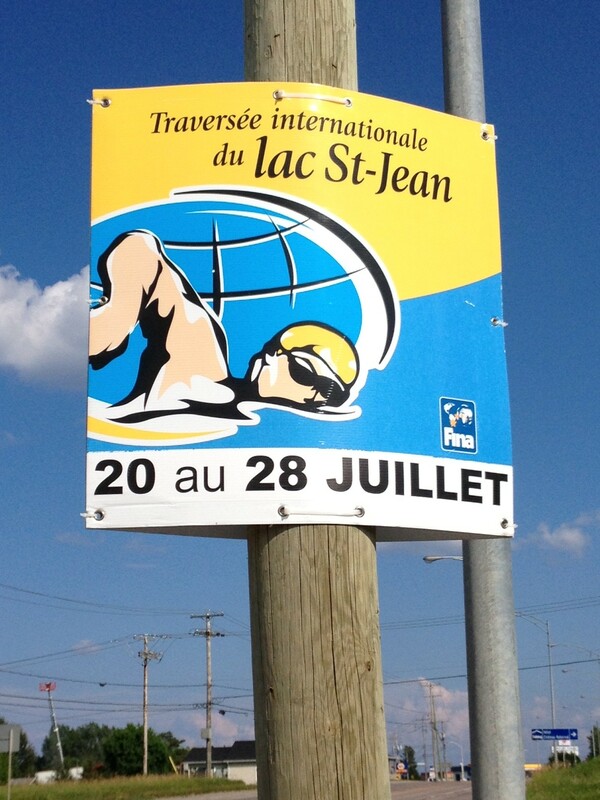 I’m here as a FINA medical delegate to supervise the medical set-up and the doping control of two swimming events that will take place on Lac St. Jean–next to Roberval, Quebec, Canada (2.5 hours north of Quebec City)–tomorrow and Saturday. 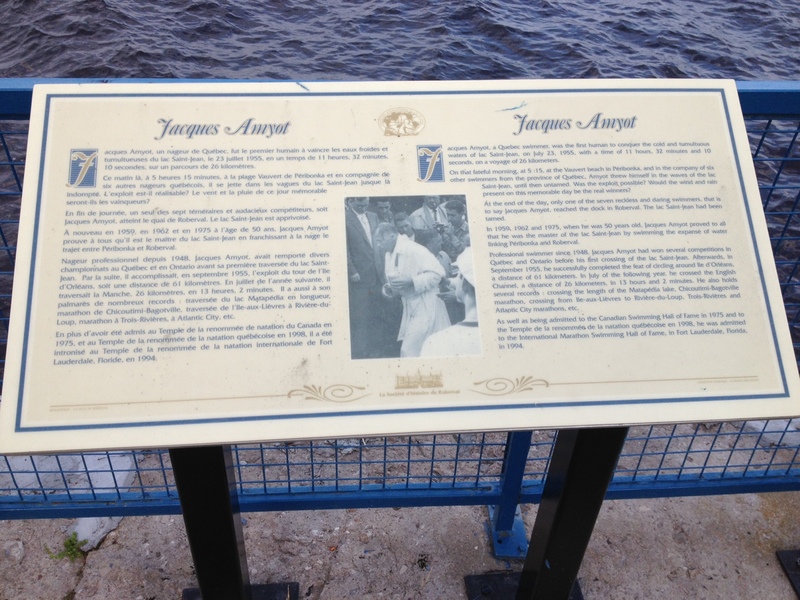 Lakeside plaque commemorating Jacques Amyot, first to make the Lac St. Jean crossing. The 32 km Traversee, to take place on Saturday, promises to be especially interesting. To put this in context, the distance is just a bit shorter than the English channel crossing, and the water temperatures in the middle of the lake will drop below 20 degrees C.
The medical tent is set up to deal with hypothermia, I can assure you of that! 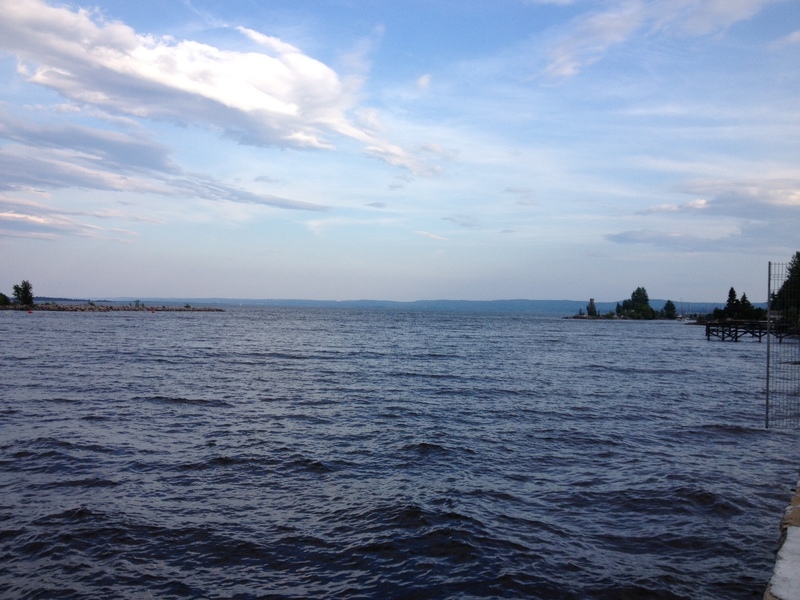 I will have more to post (pending access to Tim Horton’s……oops, WiFi) when the events have taken place. In the mean time, if anyone in the blogosphere has interesting experiences or medical literature to share on the coverage of long-distance swimming events, I look forward to hearing from you in the ‘Comments’ here or on Twitter @cjsmonline.